Why Exact Sciences could be poised for a Happy New Year in 2017. What a difference a year makes. Exact Sciences (NASDAQ:EXAS) shares got clobbered in 2015, but the stock has been on a roll in 2016 -- up nearly 60% year to date. What's next for the molecular diagnostics company? Here are three charts that could point to a great future for Exact Sciences. Scene from Cologuard video. Image source: Exact Sciences. Just how big is the opportunity for Exact Sciences' Cologuard DNA screening test for colorectal cancer? It's not the number of cases of the disease that is important to the company (although colorectal cancer is currently the second-highest cause of cancer-related deaths in the U.S.). Instead, it's the number of people who need to be screened. Data sources: U.S. Census Bureau, Exact Sciences. Chart created by author. The more important numbers on the chart for Exact Sciences, though, relate to how many Americans aren't getting screened for colorectal cancer. Nearly half of individuals who should be screened aren't. That's where Cologuard's potential is most significant. Many people don't want to have a colonoscopy to check for colorectal cancer. Cologuard's convenience and high sensitivity for detecting cancer should make it an increasingly attractive option to these individuals. Exact Sciences thinks the potential U.S. market for non-invasive stool-based DNA screening is over $4 billion annually. Cologuard won approval from the U.S. Food and Drug Administration (FDA) in Aug. 2014. Here's how Exact Sciences' revenue has grown since the commercial launch of the DNA test. EXAS revenue (quarterly) data by YCharts. Admittedly, the company is still losing money. 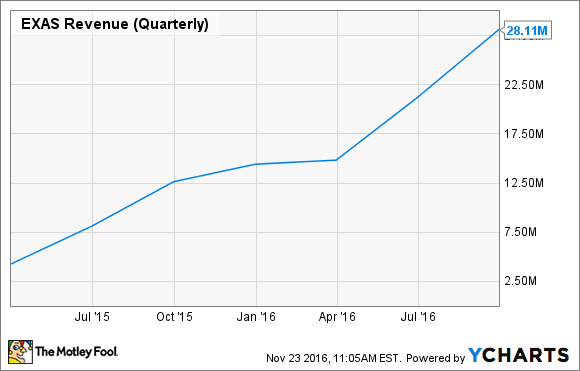 However, if Exact Sciences continues this revenue trajectory, it should be able to reach profitability down the road. There are several factors at work that explain why sales are growing quickly and why they should continue to increase. First, payers are more receptive to covering Cologuard than ever before. Second, Exact Sciences is working to engage and educate physicians about the advantages of its patient-friendly test. Third, the company has launched direct-to-patient marketing campaigns, including national television advertisements. Since Exact Sciences hasn't reached breakeven yet, its cash position receives a high level of scrutiny by investors. The good news is that right now, that cash position looks pretty good. EXAS cash and short-term investments (quarterly) data by YCharts. 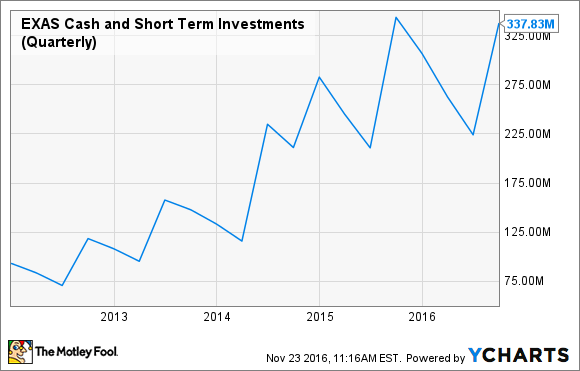 This nice balance of cash, cash equivalents, and short-term investments is due primarily to a stock offering completed in August. That offering generated $144.2 million of net proceeds. How long will Exact Sciences' current cash stockpile last? The company thinks it should be in good shape for at least through late 2017. There is a possibility, though, that Exact Sciences might feel the need to raise additional money. The company is spending more to commercialize Cologuard -- TV commercials aren't cheap. Exact Sciences is also looking at developing DNA screens for other types of cancer. I think the fundamentals are in place for Exact Sciences to succeed in the future. In some respects, the company's launch of Cologuard is still in its infancy. It takes a while to build enough confidence in payers and physicians to adopt something new. The potential market for Cologuard is large. Exact Sciences is taking the right steps to keep increasing sales for the DNA test. It has the cash to do what is needed to keep plugging along. Wall Street thinks the stock could jump over 30% in the next 12 months. I think that's possible. The future looks bright for this molecular diagnostics company over the long term.